Shampoo making machine can be used for mixing, blending and homogenizing material to manufacture liquid chemical, it is widely used in coating, medicine, chemical industry, paints, resin, food and scientific research and so on. The shampoo making machine has the advantages of reasonable structure, advanced technology, durable, and easy to operate, it is a less investment, fast input-output and high income chemical equipment. 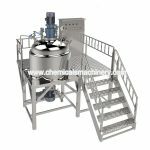 The Shampoo manufacturing mixing tank includes the parts below.